Abnormal uterine bleeding includes abnormal menstruation as well as bleeding due to problems with the lining of the uterus (endometrium) such as an endometrial polyp, or with the muscle layer in the uterine wall, such as a fibroid. An endometrial polyp is a small growth in the lining of the uterine cavity. It can cause periods to be heavier than usual or cause bleeding between periods. The vast majority of endometrial polyps are benign; however, a very small percentage will develop into malignant growths, usually if left for a substantial period of time. 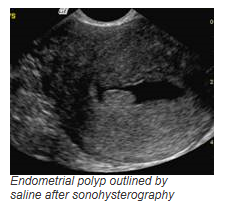 Polyps can usually be detected on transvaginal ultrasound; however, a procedure called sonohysterography is often used to make them easier to detect. This technique can detect even very small polyps that are virtually invisible in other sonographic studies. Removal of endometrial polyps commonly involves either a dilatation and curette (D&C) or direct visualisation and removal using hysteroscopy. A leiomyoma, or fibroid, is a benign growth of the smooth muscle cells in the wall of the uterus. Fibroids are extremely common, and said to be present in 25-30% of women in the reproductive age group, and in up to 40% of women over 40 years of age. They are smooth rounded masses that vary in size and location within the uterus. Abnormal bleeding is said to be present in 30% of patients with uterine fibroids. A fibroid located in the submucosal region (immediately beneath the lining of the uterine cavity) is the likely site when bleeding occurs, and may be due to distortion of the cavity or erosion of the overlying endometrium. They can also be pedunculated, located entirely within the cavity and connected to the uterine wall by a stalk. Fibroids can enlarge under the stimulation of hormones in menstruating women or during pregnancy. If the fibroid outgrows its blood supply, it may rarely result in degeneration of the muscle fibres that will then cause pain. There are a variety of treatment strategies for problematic fibroids. In some cases, medication is used to slowly shrink the fibroid over a period of months. Other fibroids may require surgery. 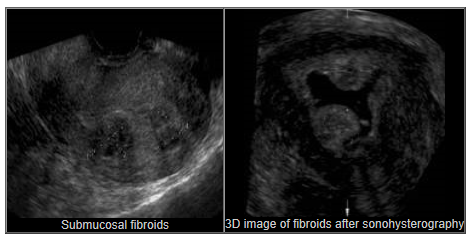 In some circumstances, submucosal fibroids can be removed via hysteroscopy, where a small telescope is inserted into the uterine cavity through the cervix. Other fibroids are usually approached either by laparoscopy (keyhole) or open surgery.